A luxuriously soft, silky-smooth, fragrance-free butter made from 100% pure and natural Aloe Vera juice and refined Coconut oil. 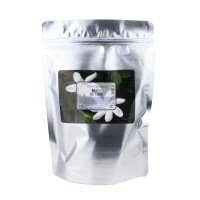 Ideal for soothing, moisturising, repairing and protecting both skin and hair. Semi-solid at room temperature. Melts on contact with skin. Our 100% natural Aloe Vera Butter is produced by infusing pure Mexican Aloe Vera juice with refined coconut oil. The resulting butter is white in colour, odourless and has a wonderful light, soft, silky-smooth texture, that instantly melts in the hand, or on application to the skin. This wonderfully hydrating, soothing butter is packed with therapeutic ingredients including vitamins, minerals, amino acids, proteins, enzymes, polysaccharides, saponins, salicylic acid and sterols that help to promote healthy skin and hair. 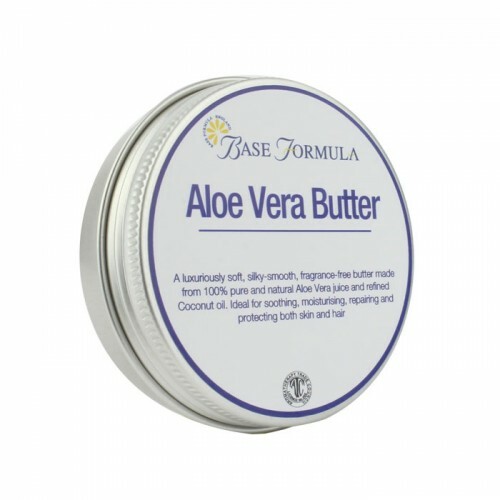 As well as being deeply nourishing and moisturising for the skin, Aloe Vera Butter also has natural antioxidant, anti-inflammatory, pain-relieving, antiseptic and antibacterial properties that can help protect the skin, fight signs of ageing and ease a whole host of skin problems such as eczema, dermatitis, psoriasis, rosacea, acne, burns, minor cuts and abrasions, rashes, scars, stretchmarks, sunburn and chapped skin. It also contains lignins – plant fibres that draw all the therapeutic ingredients deep into the skin where they can begin to take effect. Aloe Vera Butter’s pH level is very similar to our own skin, which makes it easy for our cells to absorb, and suitable for all skin types. As it is made from only 100% pure and natural, skin-kind ingredients it is also suitable for baby skincare and problems such as nappy rash! Although it can be used on its own as a standalone product, the butter’s penetrative powers make it an ideal ‘carrier’ for introducing essential oils into the skin. It makes a lovely base for aromatherapy salves and balms and can also be added to a wide variety of skin and hair care products such as moisturising creams and lotions, after sun products, body butters, soaps, lip balms, hair conditioners, hair masks and hair pomades. From a hair care perspective the butter can help to moisturise, condition and repair dry, damaged, brittle hair and split ends, as well as soothe dry and irritated scalp problems including dandruff. 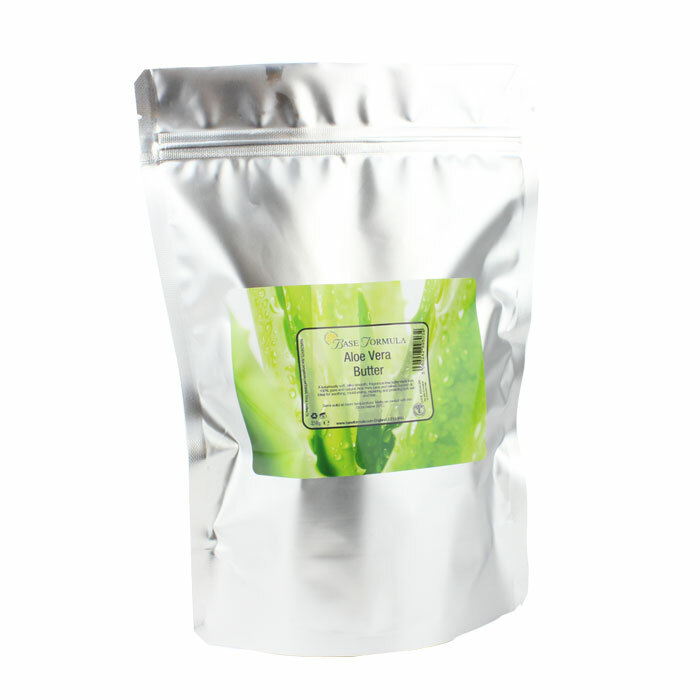 Aloe Vera Butter can be used as it comes and is ideal for applying direct to the skin or hair. To blend with essential oils, melt it gently over a bowl/pan of hot water and stir in your chosen oils. Pour into a clean jar and pop in the fridge to set. 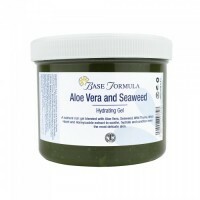 For use as an ingredient in other skincare preparations we recommend adding between 3 and 5%. Aloe Vera Butter is solid to soft at room temperature but may partially or fully melt if exposed to warm temperatures. To prevent the product melting we recommend storing below 20°C. If the butter melts and then re-solidifies too slowly it may result in a grainy texture. This is completely normal and does not impact on the product’s quality or effectiveness. To restore a smooth texture the butter can be reheated (double boiler method recommended) and placed in the fridge to cool and reset. Please note that the 50g size comes in an aluminium tin and the 250g in a resealable foil pouch. 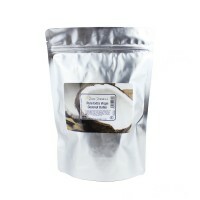 Fractionated Coconut Carrier Oil has a myriad of uses for skin, hair and body treatments.